The global in-vehicle infotainment market is expected to witness a high growth rate during the forecast period of 2016-2022. The increasing adoption of navigation systems as well as increasing demand for connected technologies in vehicles and growing safety concerns has led to the large scale growth of the in-vehicle infotainment systems market. The report is a compilation of various segments including market dynamics, market breakdown by vehicle type, by distribution channel (OEM & aftermarket), by device type, by technology type and by geography. The report focuses on the overall in-vehicle infotainment market with respect to both shipments and revenue generated. Moreover, each distribution channel type are further mapped with device types, and each vehicle type is mapped with distribution channel, and different device types as per their geographical markets. The report provides a detailed market analysis and forecast along with the recent trends influencing the markets. While highlighting the key driving and restraining forces for this market, the report also provides a detailed study of the future trends and developments of the market. It also examines the role of the leading market players involved in the industry including their corporate overview, financials, financial summary and SWOT analysis. • What the market size is in terms of revenue and shipments from 2016-2022 for the global in-vehicle infotainment market? • Which are the dominant devices in the global in-vehicle infotainment market along with their revenue and shipments? • What is the market size in terms of revenue generated and shipments of different device type with respect to vehicle types and geographical presence in the global in-vehicle infotainment market? • What are the different factors which are driving the market forward during the forecast period? • What are the major factors challenging the growth of global in-vehicle infotainment market? • Which regions will lead the global in-vehicle infotainment market by the end of the forecast period? • Country wise analysis of the in-vehicle infotainment market along with both shipment and revenue generated during the forecast period. The company profiles section includes highlights of significant information about the key companies involved along with their corporate overview, financial summary, SWOT analysis, key strategies & developmental activities of recent years (2014-2016). Some of the key players are Panasonic Corp., Clarion Corporation, Alpine Electronics Inc., Harman International, Pioneer Corporation, Continental AG, Aisin Seiki Co., Ltd., JVC Kenwood, Denso Corporation, Robert Bosch GmbH, Delphi Automotive PLC, and Magneti Marelli. The in-vehicle infotainment market has been gaining significant traction during the recent years, a great deal of which is attributed to changing consumer preferences, increasing awareness regarding infotainment systems and telematics, and decreasing average selling price of infotainment systems. The ecosystem of automotive infotainment market consists of component manufacturers, platform developers, solutions providers, telecom services provider, infotainment systems manufacturers, and automotive original equipment manufacturers. The in-vehicle infotainment market comprises of in-car navigation systems, in-car video systems, and in-car audio systems. Different vehicle types have different requirement regarding infotainment systems resulting in the different adoption rates. The global in-vehicle infotainment market was worth $33.78 billion in the FY2016 and is expected to grow at a high rate during the forecast period of 2016-2022. Developed countries currently have a higher penetration rate of infotainment systems and services whereas emerging economies hold the largest potential in terms of market growth. 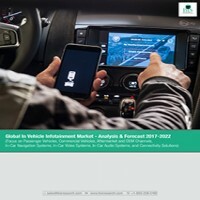 The global in-vehicle infotainment market is driven by a number of factors such as increasing production and sales of passenger cars, increasing smartphone penetration, and lowering in the cost of wireless connectivity. However, the major safety and distraction issues caused by infotainment systems along with data safety and privacy concerns are restraining the growth of the in-vehicle infotainment market. The in-vehicle infotainment market is experiencing an increased rate of participation from non-core players in the form of electronics and software companies, which has resulted in an increase in popularity and adoption of infotainment systems among all the vehicle types. The in-vehicle infotainment market has been divided on the basis of vehicle type, distribution channel, device type, technology type, and geography. Passenger car segment is currently experiencing a higher growth rate as compared to commercial vehicles. The higher production and sales of passenger cars especially in emerging countries along with increase in disposable income and improved offering from car manufacturers are fuelling the market growth for in-vehicle infotainment systems of passenger cars. The in-car navigation system is experiencing the highest growth rate among all the devices used in infotainment systems. The technological advancements leading to the decrease in the average selling price of navigation systems and changing consumer preferences towards increasing acceptability for the integrated in- car navigation systems are the main factors responsible for driving the sales of these devices during the forecast period. In terms of geographical market, the Asia Pacific (APAC) region is the largest market both in terms of installed shipments and revenue generation and is expected to witness a strong growth rate in the coming future. South Asian countries are home to some of the biggest automobile manufacturers in the world as well as the some of the biggest automotive markets. The higher production and sales of cars along with growing disposable income and increasing awareness regarding infotainment systems is responsible for the large scale market growth of infotainment systems in APAC region. Some of the key companies in the in-vehicle infotainment market are Panasonic Corporation, Clarion Corporation, Alpine Electronics Inc., Pioneer Corporation, Continental AG, and Harman International. These companies are actively aiming for an increased participation through partnerships and collaborations in order to expand their operations and improve product offerings to gain significant market presence in both the OEM and aftermarket channels.